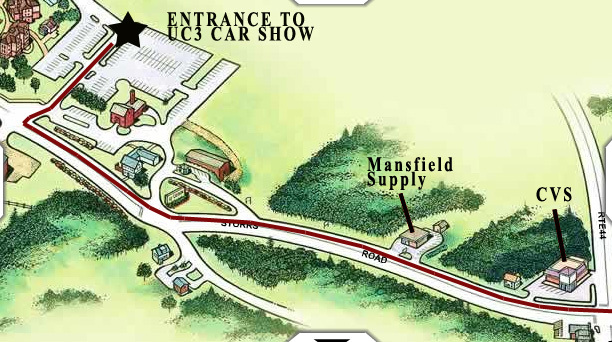 The UConn Car Club would like to invite you to be a part of our 9th Annual Spring Car Show on Sunday, April 15th RAIN OR SHINE! IT'S ON!. Please follow us on twitter for updates. There will be no pre-registration. If your group would like to park together; arrive early and drive in together as a group. 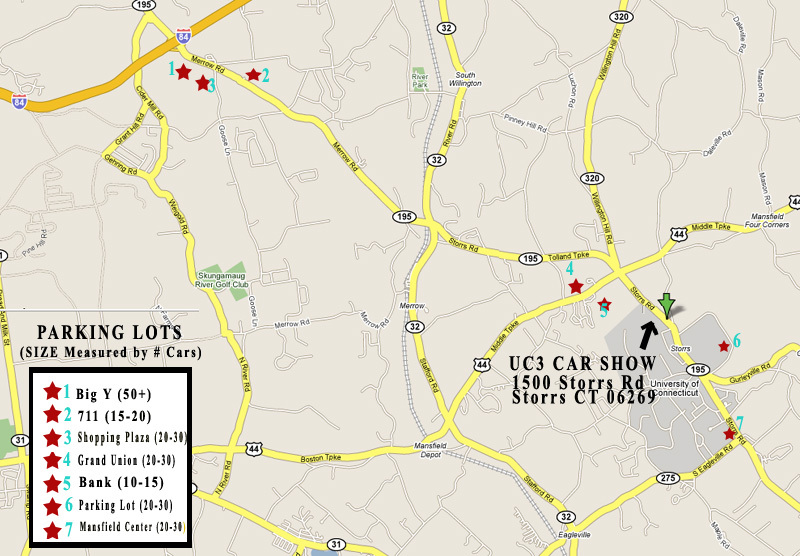 The first map attached below lists parking lots in the area and their locations so you can meet as a group before arriving at the show to drive in together. Important: This year spectator parking will be across Rt. 195 along the side of Horse Barn Hill Road. If you do not plan to register your car, please park in the spectator area. As always, parking is limited at UConn, but we will try our best to accommodate all spectators. Police Officers and club members will be there to direct you. For those who have yet to see one of our shows, we tend to amass some of the greatest diversity of cars in one place. Anyone who has been to a previous show can attest there's something for everyone, including Classics, Domestics, Imports, Euros and even Supercars. All makes, models and price ranges of vehicles are welcome. Note: Best Club Participation Club Award goes to the club with the most participating members. Best Club Award will be awarded to the club that UC3 deems to have the highest quality entrants in respect to the quality of the cars and the attitude of its members. The Type R award goes to the most ridiculously modded car. Bring your cardboard body kits! Have any ideas for our show? Anything from previous shows you would like included or excluded? Any questions, concerns or comments for us? Please let us know! We have a forum setup on our website where you can discuss anything show related WITHOUT having to register. Just follow the link here and enter the password which is UC3 (all caps). The only way to make our show better is from the input we get and we'll do our best to incorporate as many ideas as possible. - The parking lot has a maximum capacity of around 600 cars. Once the parking lot is full, THE GATES WILL BE CLOSED. No ifs, ands, or buts. Plan accordingly and it should not be a problem. - Judging will be done by the attendees and will begin at exactly Noon. Those who arrive past Noon will not be allowed to register for judging. - We will have porta-potties within the show as well as food and background music. Space is limited but arrangements can be made. I'm hoping to show all those Impreza driving kids that there is another Japanese make other than Subaru. It's always a good time too.